Just had to create something for Roxie's Sketch Challenge on SCS, so brought out some new goodies. 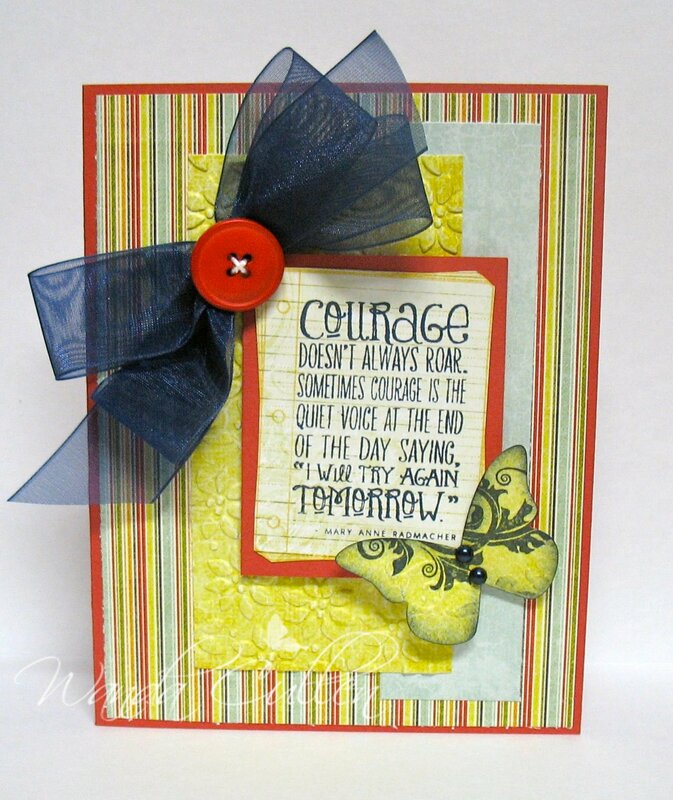 Love this new sentiment with Verve's newly released Blue Skies set: Courage doesn't always roar. Sometimes courage is the quiet voice at the end of the day saying, 'I will try again tomorrow.' It was stamped in navy on a saffron notebook page image (also from this set). 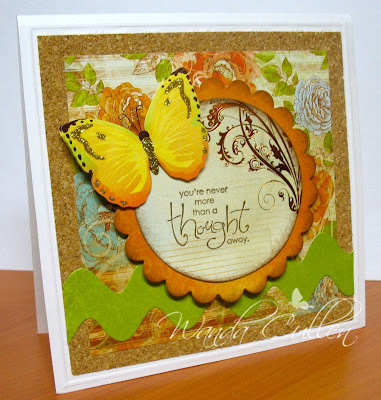 I stamped the navy flourish on some yellow DP then ran it through the CB with the butterfly embosslit from SU where it die cut the shape plus embossed it. Later, I wished I had made the pale blue strip navy...but too late to tear it apart. It is what it is. Betty's Color Challenge on SCS was to use Dusty Durango, Crushed Curry & Bermuda Bay with a dessert option to add design or texture to DP. I ran the tropical floral border through the CB using Petals-a-Plenty EF. 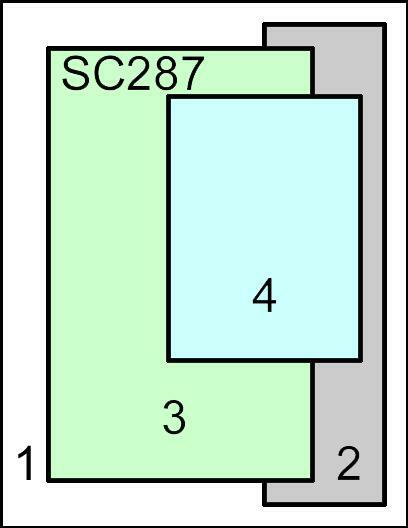 The Durango base was also CB'd using the Square Lattice EF. Love my new Die-namics ric-rac die which I thought simulated ocean waves. 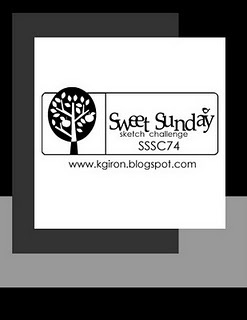 The layout is Mercy's Tuesday Sketch Challenge. 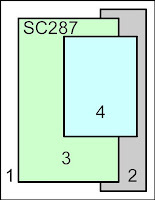 This is where I plan to be sitting next week...by the sea...watching the waves. COULD NOT BELIEVE IT! The Verve release party was this past Friday night and I got my new stamps TODAY! Now THAT is fast shipping! The Waltzingmouse Sketch Challenge for this week was a doozy! I wasn't going to play until I saw the trio of stars image and the light bulb went off. 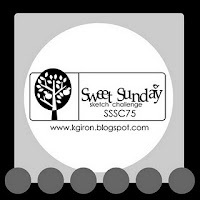 :-) I placed a round Nestie on the vellum as a guide and stamped the image around the circle. I then punched some gingham stars and popped them with dimensionals. 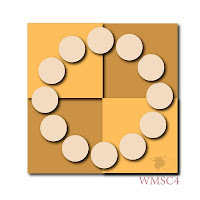 It's hard to see, but I stitched the four BG squares together. Time for some fresh squash and corn for supper...gotta go for now. 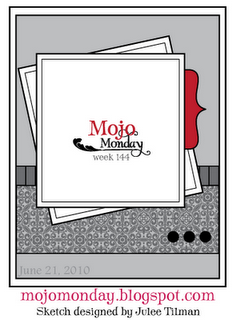 ...and it's the last Monday of the month, so Julee's Mojo Monday Challenge offers us a round or square option with our cards. 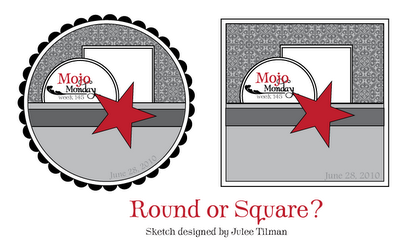 Circles are always more challenging for me, but I wanted to give it a whirl. I had a scrap piece of cork laying out, so went with that for the top half of the BG. Pretty straight forward...I did add some Crystal Effects to the center of the flower. So...normally I don't consider collage stamping to be CAS...but I'll defend this tag as a CAS Challenge entry because it's one layer; the sentiment & butterfly are stickers and the polka dotted green around the fiber hole was a pre-punched die that came with the DP pad. Only a few swipes of a sponge and some quick stamping created the BG. I guess it's more simple than it is clean, but hope the challenge police won't be arresting me any time soon! Jen challenged us to use her signature line colors which are Bashful Blue, Certainly Celery & Pumpkin Pie. 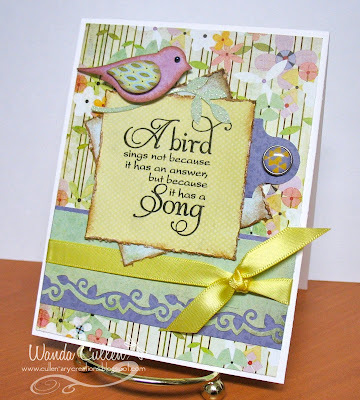 This also qualifies for ODBD's Shining Light Challenge to create a bookmark. I can't stay awake any longer...good night! No, I'm not hitting the bottle...I'm actually cutting some new cork sheets that I recently bought at Mike's. I like the added texture it gives to cards. This is a card for Karen Giron's Sweet Sunday Sketch Challenge. I hope the curves of the ric-rac border qualify for the circle elements in the sketch. The butterfly is a sticker from Martha. The base CS is a pre-embossed card...also found at Mike's. This came together quickly and was a good way to wind down after a work shift. I was glad it was quiet so I could browse through the new SU cattie. 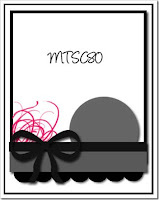 Though I didn't get excited about too many of the stamp sets, I did love the new DP and some of the accessories! Yay, this is my 5th and last Verve challenge card to celebrate the release of new sets this Friday! Head over to the Verve forum on SCS and check out the contest details! 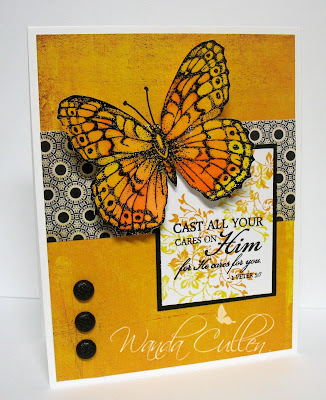 I had fun with this butterfly...embossed him first by stamping in Versamark on watercolor paper, then heat embossing with black EP. Julia's Way to Use It Challenge was to heat emboss...symbolic of the heat wave that most people are experiencing. I then spritzed the image with water, dipped a brush in Only Orange reinker and a second one in Summer Sun reinker. I touched the brushes lightly to the image and the ink ran and filled up the embossed sections. I figured if the technique works on rose images, why not butterflies?! I liked the finished guy and perched him on the card to steal the show. The sentiment is one I especially like from Verve...I've been trying to follow it in my personal life as stressors get a bit overwhelming sometimes. We don't have to carry the load alone...we can cast it all on HIM and what a relief it can become for us! 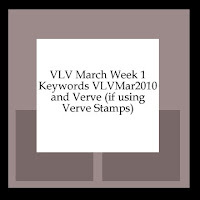 This is the 4th Verve challenge card this week...let's hope all this effort leads to some free prizes! 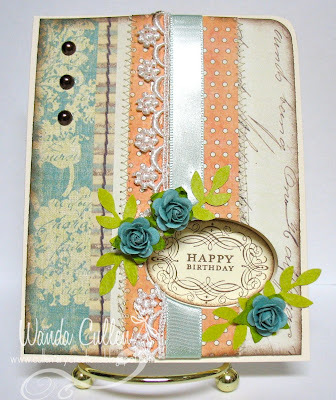 :-) Love the homespun feel of the polka dots, so had to pick up on this by used dotted ribbon and dotted DP. 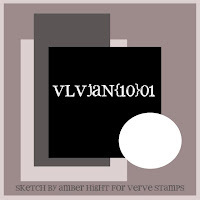 The layout is one of Amber's Viva la Verve sketches in April and is a fave of mine. With all the white BG and silver pearls, it's done in the infamous Silke Ledlow style that I always admire! 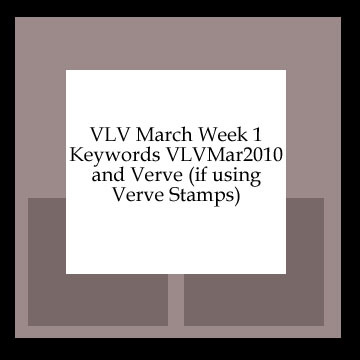 This is the 3rd challenge card for this week's release celebration on Verve. I got some new SU goodies this week...LOVE the Level 1 hostess Patterns Pack III - it's got gorgeous colors in it! Also love the bitty buttons that have matching punches...no need to ever buy different colored brads again! Well, guess I wouldn't go THAT far - lol! I used stamps from 3 different Verve sets...one reason I love Julee's creations...they're so interchangeable! Check out the Verve forum on SCS...you can win free stuff if you participate! 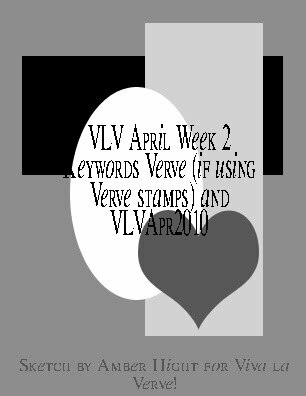 This is my 2nd Verve challenge card (check out the contests on the Verve forum on SCS) to celebrate a new release this Friday. 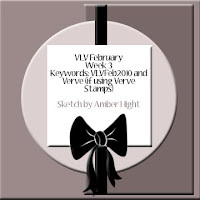 We were to pick one of Amber's February sketches for the layout. I went with SU's Afternoon Tea DP and highlighted the card with a pearl flourish, a prima with punched leaves, grosgrain bow & the fun new bitty buttons from SU! They have coordinating punches, so you can match them up with anything you're making. I added a green gemstone as they seemed to get a little lost without another pop of color. The sentiment is a Plain Jane (Psalm 31:24) by Verve. 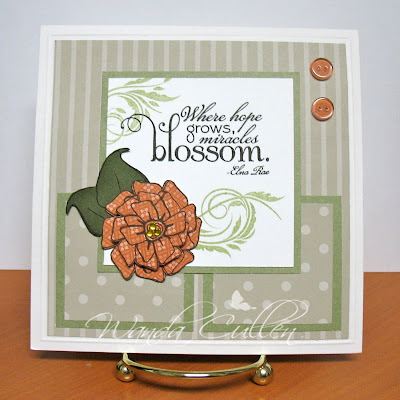 Play along for a chance to win new stamp sets! Julee is releasing new Verve stamps this Friday so this is my first challenge card for the week using a sketch from Amber's Viva la Verve challenges. 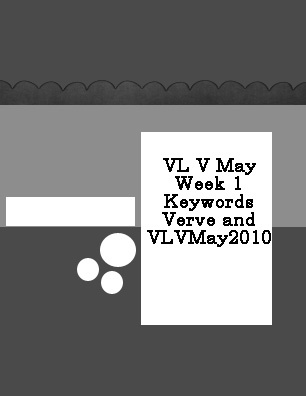 See the Verve forum on SCS for details. 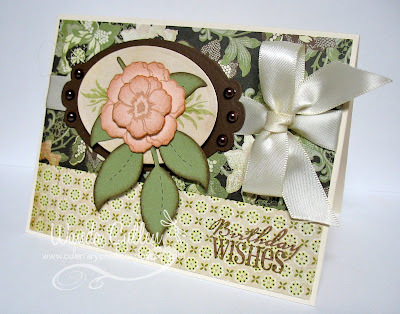 This is pretty straight forward...the flower was colored with Copics and layered for dimension. 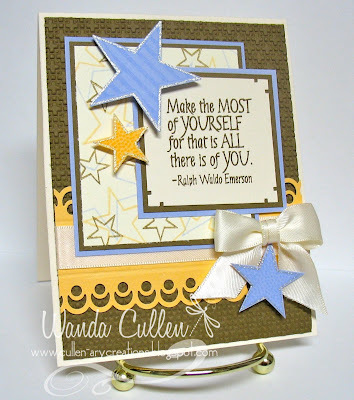 The base card is pre-embossed - found at Michael's. I used Karen Giron's Sweet Sunday Sketch Challenge for the layout, the colors from Betty's Color Challenge (Soft Suede, Almost Amethyst, Apricot Appeal), and the Verve set 'Seeing Stars' for Julee Tilman's Ready, Set, Stamp Challenge: Seeing Stars. Love this new EF by SU to give the suede layer a basketweave feel. 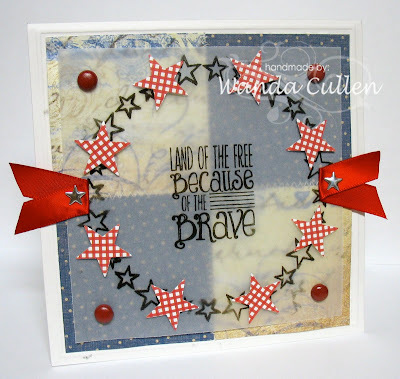 I created my own star-studded DP, then stamped and punched and popped 3 different accent stars. 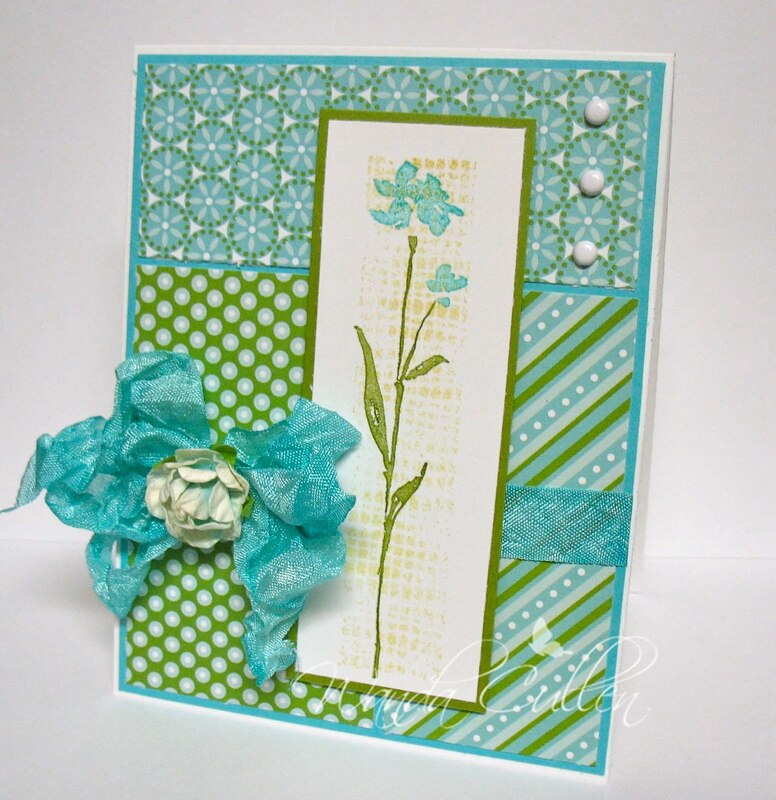 The edges were highlighted with a Sakura Gellyroll Clear Star pen to add a hint of sparkle. TFL! ACCESSORIES: Star punches (SU), Optic Dot border punch (MS), Satin ribbon, Textured Impressions Square Lattice EF (SU), Corner punch (? name). Julee's Mojo Monday Sketch Challenge was perfect to use a larger sentiment as the focal point. Some distressing and sponging around the 2 square panels, a punched bird and branch, ivy punched border...all came together easily. 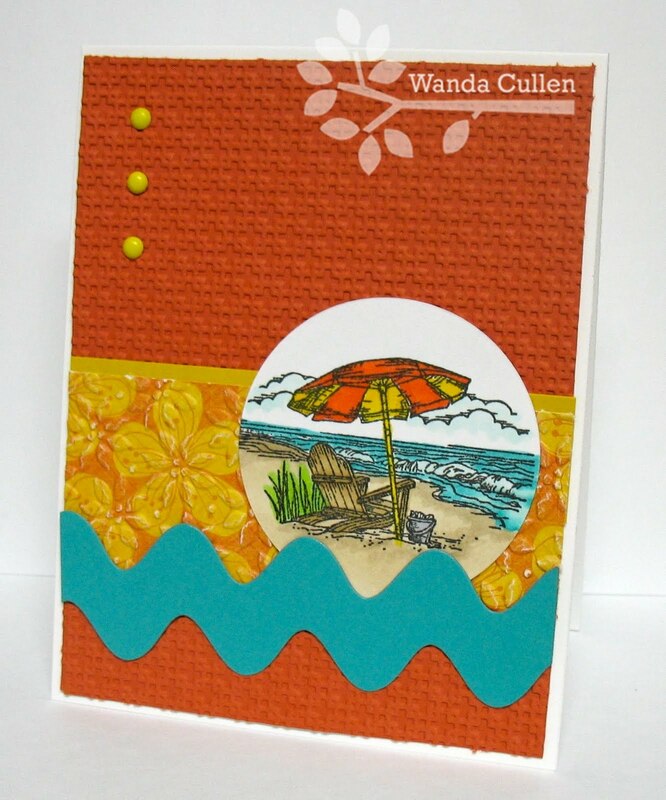 The purple tab was a die cut that came with the Lilac Avenue Collection pad. Time to head to work so have to hurry with this post. Happy summer to you...it's officially here! Using Diane's CAS card sketch, I quickly put this card together. 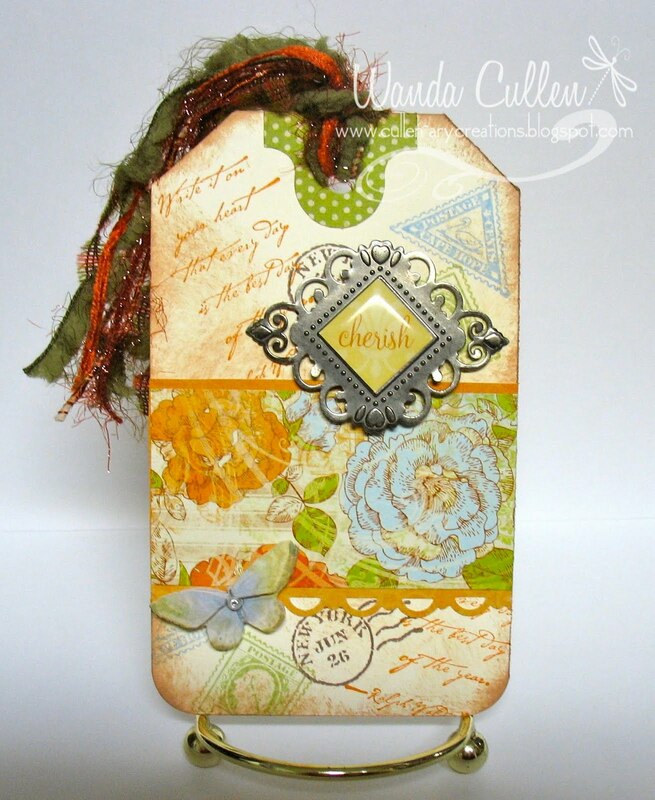 Great way to use up scrap pieces of DP! 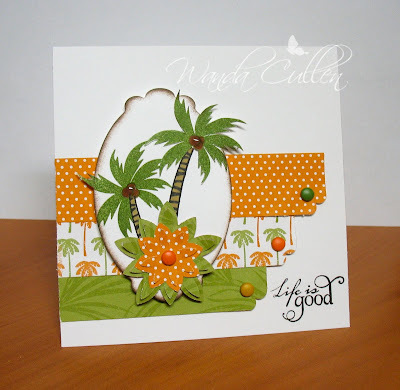 The Nestie was a leftover from a previous project...a couple of stamped trees, a punched lily and a quick touch of Crystal Effects to the coconuts and I was done. Pam Hooten (aka IRIS on SCS), a former member of the dirt pile, was chosen as this week's FS. 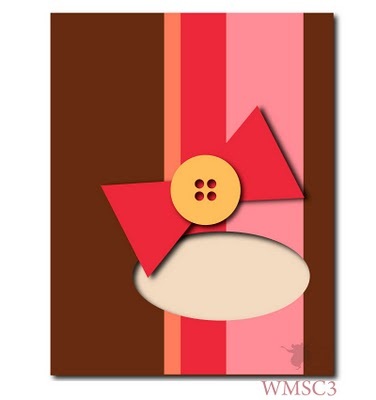 She has a fabulous gallery with so many things to inspire you, but I chose this floral card to CASE. I changed the image, the DP, the ribbon and kept the layout and theme the same. 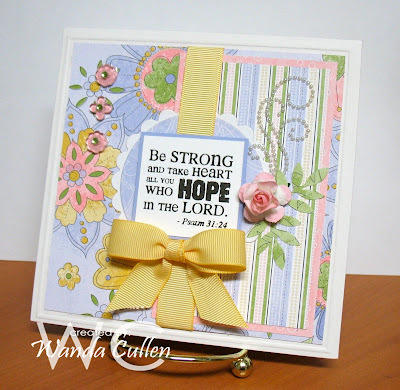 The ribbon is seam binding that I dyed using Tattered Angels Glimmer Mist. TFL! Celebration Time is Just Around the Corner!